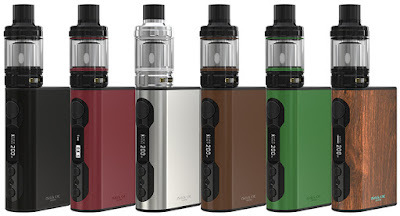 Eleaf iStick QC 200W Kit is a heaven-made match of huge power for cloud chasing, which comes with a 5000mAh iStick QC MOD and Melo 300 tank. 6 colors. The iStick QC 200W comes with a massive 5000mAh built-in battery giving it a powerful 50A/200W maximum output. Stylish, sustainable and powerful, the iStick QC 200W also features a 1.5A quick charging capability when using the Avatar Quick Charger. The innovative RC adapter (optional accessory) will convert the iStick QC 200W’s 510 connection into a USB output for Power bank mode when necessary. With a retractable top fill and powerful ES coils, the MELO 300 pairs with the iStick QC 200W perfectly for cloud chasing. This Full Kit is in stock on our store , only $55.90 you can get one !